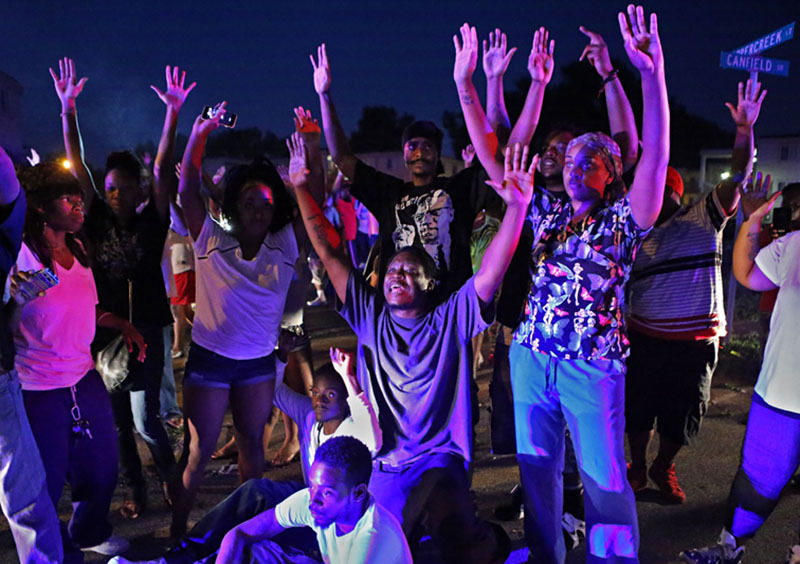 "Don't shoot us" cries out the crowd as they surround and taunt police officers arriving to break up an angry crowd of protesters on Canfield Dr. in Ferguson on Saturday, Aug. 9, 2014. Hours earlier police officer Darren Wilson shot and killed Michael Brown, an unarmed 18 year-old man only yards away. It was rumored in the crowd that that Michael Brown had his hands up when he was shot by the police. This night was the genesis of the "Hand up, don't shoot" rallying cry of the Ferguson protests that spread across the country.